This version of the A-Star 32U4 Robot Controller SV with Raspberry Pi Bridge (5.5 V to 36 V input voltage) does not include any through-hole components. It ships as shown in the picture above, without any male or female headers, terminal blocks, DC power jack, buzzer, or Raspberry Pi mounting hardware. 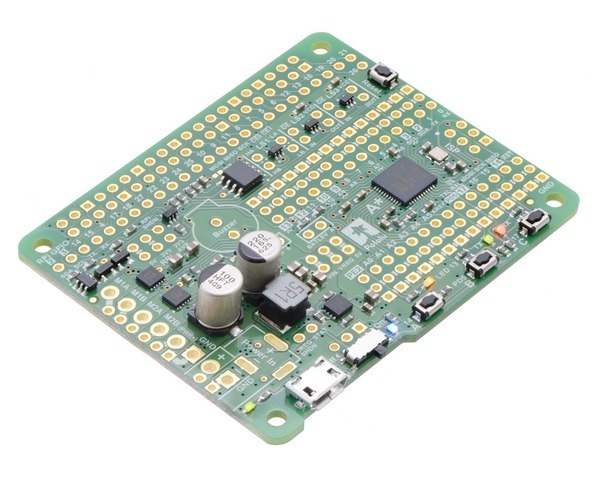 This configuration is intended for those who want to use the board as a standalone robot controller or customize the way it is assembled for use with a Raspberry Pi, such as by installing a stackable 2×20-pin female header in order to continue to have access to the Raspberry Pi’s 40 GPIO pins while the A-Star is plugged in. If you want to use this version with the Raspberry Pi, we recommend you also get 11 mm M2.5 standoffs along with compatible nuts and screws.